There has been much confusion regarding the classifications of Golden Retrievers. First and foremost, Golden Retrievers refer to the medium-sized breed that were historically bred as gundogs to retrieve (hence the name) shot fowls and other animals during hunting. As the breed was accepted in several countries, specifically England and the United States, two major different standards of breeding the Golden Retriever developed. In 1911, the Golden Retriever breed was accepted in the British Kennel Club (KC) while it was accepted in the American Kennel Club (AKC) in 1934. Throughout time, the Americans took a different standard of breeding to match the preferences of the American market while the British diverted their efforts to suit the European taste. The American Golden Retriever and English Creme Golden Retriever are both generally speaking Golden Retrievers. Wherever you are in the world, your Retriever will be registered under "Golden Retriever" with no additional sub-specification in the registry. Take note that English Crème Golden Retrievers are simply called "Golden Retrievers" throughout Europe and the rest of the world. In the United States, however, they are often called English Creme Golden Retriever simply to differentiate it from the American ones, due to their difference in color and other qualities. In other words, English Creme is a coined term to differentiate the breeding qualities between the American and the English ones. Other names for the English Crème Golden Retrievers are White Golden Retrievers, European-style Golden Retrievers, English Golden Retrievers, Imported Golden Retrievers, British Golden Retrievers or simply English Cremes. Therefore, if you'd follow all technical correctness, the English Cream Golden Retriever is basically "a Golden Retriever bred to the KC standards" and an American Golden Retriever is "a Golden Retriever bred to the AKC standards." Presented below are the major differences between the American Golden Retriever as bred by the AKC and the English Creme Golden Retriever of the KC. To reiterate, an American Golden Retriever are bred to the AKC standards, while the English Retriever are bred to the KC standards. The differences of these breeding standards are presented as follows. The most obvious difference between the two retrievers is the color of their coats. American Golden Retriever: The AKC describes an American Golden Retriever's color to be "rich, lustrous golden of various shades". Extremely dark or extremely light colors are not accepted within the breeding standards. This would mean that judging of the acceptability of color is, to an extent, left to the judge's discretion. English Cream Golden Retriever: The KC describes the English Cream Retriever to be of the shades of cream and to some extent gold. Mahogany and reds are not accepted. AKC Coat Characteristics: Dense and water-repellent with good undercoat. Outer coat firm and resilient, neither coarse nor silky, lying close to body; may be straight or wavy. Untrimmed natural ruff; moderate feathering on back of forelegs and on underbody; heavier feathering on front of neck, back of thighs and underside of tail. Coat on head, paws, and front of legs is short and even. Excessive length, open coats, and limp, soft coats are very undesirable. Feet may be trimmed and stray hairs neatened, but the natural appearance of coat or outline should not be altered by cutting or clipping. KC: Flat or wavy with good feathering, dense water-resisting undercoat. In layman's terms, this means that American Goldens have longer fur and a thicker coat. English Creams have relatively shorter coats and tend to be wavier. The Golden Retrievers were originally bred to be retrieving dogs which is why their coat was designed to be water-resisting and thick enough to withstand rougher terrains which includes wounds from bushes, etc. HEAD: Broad skull, and arched laterally and longitudinally to some degree but without prominence on the occipital bones or forehead. It has a deep and wide foreface which is almost as long as the skull. Its muzzle is straight, bending smoothly into the skull. Flews have no heaviness. Whiskers can be removed but is not preferred. EYES: AKC Golden Retrievers possess an intelligent and friendly expression with medium large dark eyes and closely-fitting rims. Eyes are set reasonably apart and deep in sockets. Preferred eye color is dark brown, with medium brown still acceptable. Eyes are rather slant and narrow. Triangular eyes are considered a fault. NECK: Neck is medium long and merges into well laid back shoulders. Neck provides a muscular and sturdy physique and appearance. EARS: Ears are more of short with the front edge attached just above the eyes and fall close to the cheeks. When the ears are pulled forward, it should just be about able to cover the eye. Hound-like and low wears are faulted. HEAD: English Cremes have a very well-chiseled and balanced head, and its skull is broad without coarseness. A powerful, wide and deep muzzle and the foreface length is about the length from stop to occiput. EARS: English Cremes have moderately sized ears and set at approximate level with eyes. EYES: Eyes are dark brown with dark rims, and are well set apart. NECK: Neck is of good length and is muscular and clean. Aside from these specs for each breeding standard, the head of American Golden Retrievers are slightly smaller than those of the English Cremes, which is specifically visible in males. This relates to the fact that the necks of English Cremes are relatively more clean and muscular to support the bigger head. In KC standard, there is no strict rule on clipping, whisker trimming, grooming and so on, as compared to the AKC where these things are seen of great significance. In KC standards, the main focus is to make a great pedigree with ideal offspring, making superficial changes such as trimming irrelevant to their standard. In terms of muzzle and foreface, AKC aims for straight muzzles and the foreface to be the length of the skull. This accounts of the American Golden's muzzle to be smaller and more conical in shape. The KC standard aims for more laconic muzzles and the length of the foreface to be the length from stop to occiput. This accounts for English Cremes to have wider and bigger muzzles with strong jaws. In terms of eyes, the eyes of American Goldens are wider apart as compared to English Cremes. In terms of ears, AKC breeds the Goldens to be well behind and above level of eyes. KC breeds them to have the ears to be at level with eyes. This accounts for the rather different faces of the English Cremes and the American Goldens. There are certain health differences between the American Goldens and the English Creme. American Goldens have a significantly higher chance of getting cancer as compared to English Cremes. This is based on research and statistics done. The median age of American Goldens is 10 years and 8 months, while the median age for English Cremes is 12 years and 3 months. English Cremes are bigger boned, bulkier and also have blockier heads as compared to American Goldens. AKC: Strong and level from withers to slightly sloping croup, whether standing or moving. Sloping backline, roach or sway back, flat or steep croup to be faulted. KC: Calls for level top line. AKC: Strongly muscled. Profile of croup slopes slightly; the pelvic bone slopes at a slightly greater angle (approximately 30 degrees from horizontal). In a natural stance, the femur joins the pelvis at approximately a 90-degree angle; stifles well bent; hocks well let down with short, strong rear pasterns. KC: Loin and legs strong and muscular, good second thighs, well bent stifles. Hocks well let down, straight when viewed from rear, neither turning in nor out. English Cremes have a more leveled topline with legs straighter while American Goldens mostly have slightly sloping topline with their legs standing more out. KC standard is very straightforward on this matter: level topline! AKC allows for (slightly) sloping croup (back part) while KC prefers the dogs' natural back which is not a dramatic sloping one. AKC: Tail well set on, thick and muscular at the base, following the natural line of the croup. Tail bones extend to, but not below, the point of hock. Carried with merry action, level or with some moderate upward curve; never curled over back nor between legs. KC: Set on and carried level with back, reaching to hocks, without curl at tip. Which Breed Standard Is Better? The answer truly lies in the eye of the beholder. As you can see, the different standards in breeding are generally all with an aesthetic purpose in mind. 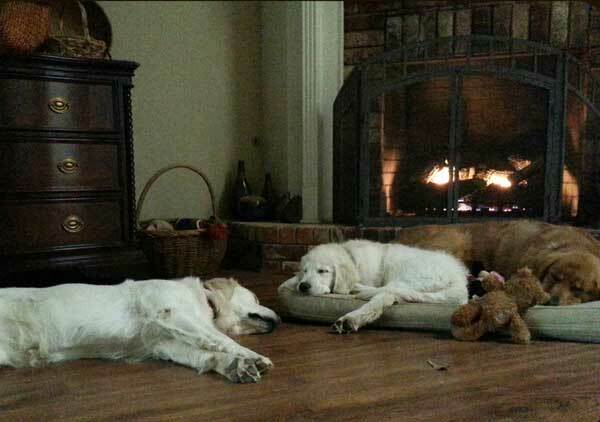 Some people like their Retrievers in rich golden color while others prefer a creamy light color. AKC and KC retrievers have rather different facial features; hence, it may be completely up to the very moment of entering the breeder's home or store and you fall in love with either one of them on the spot. Regardless, Golden Retrievers in general are fun, loving, and perfect family dogs. They are great around children and are acclaimed for their superior intelligence with the capability to memorize and understand around 240 human expressions, words or phrases.